BREXIT will see Britain leaving both the single market and the customs union, Philip Hammond has confirmed, after days of tantrums over a hard exit. Speaking to the BBC’s Andrew Marr, the Chancellor said leaving the European Union also meant opting out of the bloc’s trading arrangements. The confirmation Brexiteers have been waiting for came after the BBC host quizzed the Tory Cabinet Minister on his stance. Mr Hammond replied: “Yes. Definitely, we’re definitely leaving the EU, and because we are leaving the EU we will be leaving the single market and the customs union. 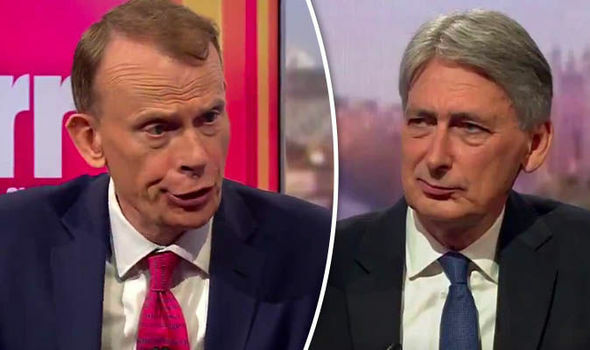 Mr Hammond, however, added he wanted to avoid the cliff edge scenario feared by Remainers, as he told the BBC host a seamless departure was needed. He said: “That is the issue, when I talk about Brexit that supports British jobs, British investment, British business, I mean a Brexit that avoids those cliff edges. “That ensures we segway seamlessly from the customs union that we are in at the moment to a new arrangement in the future that will continue to allow British goods to flow. It comes after senior Whitehall sources told The Daily Telegraph that Mr Hammond was pushing for a deal where Britain could retain associate membership of the customs union, but retain the freedom to negotiate separate deals on trade services. Speaking ahead of a meeting in Luxembourg with EU finance chiefs on Friday, the Chancellor was also vague when asked by reporters if Britain should stick to Theresa May's hard Brexit plan. Mr Hammond has made no secret of his preference for a soft Brexit, where the UK would withdraw from the EU but retain some form of associate membership to the customs union. The Chancellor’s words are in stark contrast to the bullish message sent out by the government's Brexit department ahead of Monday's talks. A spokesman for Britain's Brexit department said: "As we set out in the Article 50 letter, our view is that withdrawal agreement and terms of the future relationship must be agreed alongside each other. "We believe that the withdrawal process cannot be concluded without the future relationship also being taken into account. The withdrawal and future are intimately linked."